Death Metal can be found in various forms, sub-genres, and in many different, weird shapes. The question is what drives one to deform Death Metal, which is already a brutal genre? What drives one to create a sound that is malicious, malevolent, dark, extreme, and extraordinary? 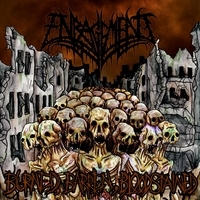 Well, Helsinki, Finland based extreme and brutal Death Metal group ENRAGEMENT might have the answer to that question. The band was formed in 2006, and the reason they are an interesting band to keep an eye out for is the fact that they weren’t formed in the 90’s, or earlier. The reason is hidden in the year when they were formed, which is after the second millennium, and that’s where the new wave of experimental bands had begun; an age when bands would go on to form a new sound, a sound that some will call old-school in the distant future. Being active for only 11 years, the band have released only two full-lengths and a single. It might be only two, but those two are definitely worth the time of an average Metal or music fan. Their self-released debut, “Omnimalevolence of Man” saw the light of day in 2014, and the album consisted of 9 tracks that spanned over forty minutes. Another reason one should totally look out for this band’s material is their lyrical themes. The themes are sad and brutally honest, and focus on the dark side of our consciousness: mass murdering, dark themes, and on the mind of men that are up to no good; basically, the dark side of the psyche. They proved that well on their debut. Three years later, this year, they have released their single, which is available on Youtube, called “Blood for the Sun God”, which will also be included on the new record. Also, let’s not forget to mention that the release date of their new album “Burned, Barren, Bloodstained” will be June 9th, and the label that’s going to release the album is the hard-working, not-enough-attention-getting Finnish label Inverse Records. With 11 songs, this is an album you should absolutely look for in the not-so-distant future, and if you do stop by the label, check out some of the other names too. Prepare yourself for this album, for it is a great mix of brutal, aggressive, and extreme Death Metal, which is spiced up by just a bit of Black Metal and some Grindcore parts - which are rarely heard, but if you pay attention, everything will be clear enough. Get ready for something different, unique, but still unbelievably good!